The traditional model of PAR activation focuses on the role of the heterotrimeric Gs protein to activate the cAMP pathway. PAR activation also leads to the liberation of GPy dimers that contribute to the recruitment of GRKs to the membrane, leading to phosphorylation of agonist-activated PARs (Fig. 1b). P-arrestin then binds GRK-phosphorylated PARs and acts both to sterically interdict further G protein signaling and to promote PAR desensitization. However, P-arrestins also act as scaffolds for components of the membrane trafficking machinery that internalize GPCRs from the surface membrane (including clathrin, AP-2, N-ethylmaleimide-sensitive factor (NSF), ARF6, ARNO, and Mdm2) and for signaling proteins (such as Src, JNK3, ASK1, ERK1/2, and PDE4D3) that provide for G protein-independent activation of growth/apoptosis regulatory pathways (Luttrell et al. 1999; McDonald et al. 2000; Miller et al. 2000). AKAPs constitute another class of PAR-interacting scaffold that assembles components of the PAR signaling machinery at membranes and functionally regulates both the formation and hydrolysis of cAMP (Fig. 1c). AKAPs comprise a family of structurally diverse proteins that contain an amphipathic helix that binds the PKA regulatory subunit (R) with high affinity as well as targeting motif that directs the AKAP-PKA complex to a specific subcellular location. Individual AKAPs display distinct binding affinities for RII, providing a mechanism to dynamically regulate PKA-dependent phosphorylation of individual substrates in cells. P2ARs are recovered from both tissue and cell preparations in complexes with two distinct AKAPs, AKAP79/150 and AKAP250/gravin (Fraser et al. 2000; Shih et al. 1999; Tao et al. 2003). P2ARs constitutively interact with AKAP79/150, providing a mechanism for forced proximity with PKA, PKC, and PP2B (which also interact with AKAP79/150) and P2AR phosphorylation by PKA. This phosphorylation is believed to switch P2AR-G protein coupling from the GascAMP pathway to a Gi pathway that activates ERK (Fig. 1b, Fraser et al. 2000). Although AKAP79/150 does not directly interact with GRK2, AKAP79/150 is required for PKA-dependent phosphorylation of GRK2 (at S685), which increases GRK2 affinity for GPy subunits, leading to enhanced GRK2 translocation to membranes and GRK2-dependent P2AR phosphorylation (which creates a docking site for P-arrestin and leads to PAR desensitization, Fig. 1b, Cong et al. 2001). However, P-arrestin (localized to the P2AR-AKAP79/150 complex) also recruits the cAMP-specific phosphodiesterase enzyme PDE4D5, which functions locally to attenuate cAMP generation/PKA activation and prevent the PKA-dependent P2AR switch to Gi-ERK (Perry et al. 2002a; Wallace et al. 2005). In neonatal cardiomyocytes, PDE4D activity limits signaling through the P2AR-/ PKA-dependent pathway that increases contraction (Xiang et al. 2005). In contrast, PjAR-dependent regulation of cardiomyocyte contraction is not influenced by PDE4D (presumably due to the relatively low affinity of PjARs for P-arrestin and a relatively inefficient recruitment of P-arrestin-PDE4D complexes). While all PDE4 family members bind P-arrestin through a highly conserved site in the catalytic portion of the enzyme, PDE4D5 is preferentially recruited (relative to other PDE4 isoforms) to agonist-activated P2ARs due to the presence of a unique N-terminal P-arrestin-binding site that allows for a second point of contact between these proteins (Perry et al. 2002). Of note, the PDE4D5 N-terminal region that binds P-arrestin also interacts with RACK1 (a WD repeat protein that acts as a scaffold for PKC). Since these are mutually exclusive binding interactions, the ability of PDE4D5 to toggle between P-arrestin and RACK1 is predicted to dictate signaling specificity (Yarwood et al. 1999; Bolger et al. 2003). 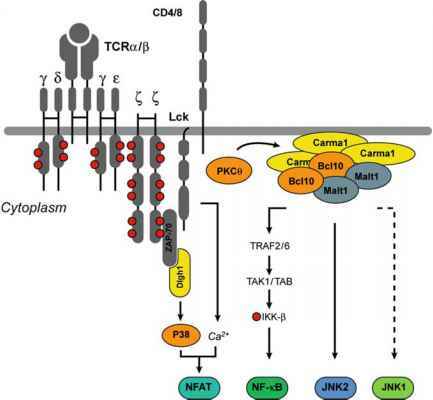 Finally, there is evidence that AKAP79/150 interacts with both adenylyl cyclase V (ACV) and ACVI enzymes and assembles a local negative feedback loop to terminate cAMP signals by facilitating PKA-dependent AC-V-S676/AC-VI-S674 phosphorylation (which inhibits cAMP generation, Fig. 1c, Bauman et al. 2006). AKAP250/gravin is the second scaffold that nucleates P2ARs-PKA-PKC-PP2B complexes (Fig. 1c, Shih et al. 1999). AKAP250/gravin binding has been mapped to residues R329-L413 in the C-terminal cytoplasmic tail of the P2-AR; the P2-AR-AKAP79/150-binding site has not been identified (Fan et al. 2001). While P2-ARs constitutively interact with AKAP250/gravin in resting cells, agonist activation strengthens 0AR-AKAP250/gravin interactions as a result of PKA-dependent phosphorylation of AKAP250/gravin at S696, S698, and S772 (the P2-AR docking site on AKAP250/gravin, Tao et al. 2003). AKAP250/gravin then inducibly associates with GRK2, 0-arrestin, and clathrin; it functions as a mobile scaffold to internalize along with agonist-activated 02ARs and control agonist-dependent 0AR desensitization, sequestration, and recycling/resensitiza-tion (Lin et al. 2000; Fan et al. 2001). The recent observation that AKAP250/ gravin also associates with PDE4D isoforms could suggest that this scaffold plays yet an additional role to terminate subplasmalemmal cAMP signals, although a specific role for AKAP250/gravin in the dynamic control of cAMP signals localized to the plasma membrane has not been established (Willoughby et al. 2006). Collectively, these studies indicate that 02ARs associate with at least two distinct AKAPs (which assemble different subsets of second messenger-activated kinases and protein phosphatases); these 0AR-AKAP complexes may reside in physically distinct subcellular compartments and differentially regulate cAMP signaling events that differ in time and space.